Attaining green restrooms isn't only about products it requires proper cleaning processes. Custodial managers must create a clean, pleasant, safe and healthy restroom using products as well as cleaning processes that reduce negative health and environmental impacts. Today, we're paying close attention to reducing energy, eliminating product waste and reducing water consumption. For this reason, facility executives are looking to green their operations and improve environmental initiatives. Specifically, there is a renewed focus on the restroom. Departments can use the greenest restroom products available, but if used incorrectly, there can be enormous implications for the facility and the environment. For instance, a green cleaning chemical manufacturer recently conducted an informal study, asking five housekeepers to test the company's new green window cleaner on restroom mirrors. Unbeknownst to the housekeepers, the manufacturer was also looking at how the products were being used. Of the five, three sprayed the green window cleaner directly onto mirrors and then wiped with a cloth. The other two applied the window cleaner to the cloth first and then wiped the mirrors. Although all the products used were certified green, only one application is considered green: as with similar cleaning chemicals, window cleaner should be applied to the cleaning cloth first, not the surface to be cleaned. This simple step results in less chemical volatilization — fewer chemicals released into the air — and reduces the possibility of inhalation. • Properly dilute chemicals, preferably using an autodispensing system. This eliminates waste and ensures that the right amount of chemical is used for the cleaning task at hand. • Select and use highly concentrated chemicals. This reduces packaging and transport needs, minimizes waste and reduces the amount of energy and fuel necessary to deliver products. • Adhere to proper dwell times. While this applies mostly to disinfectants and sanitizers, many cleaning chemicals are most effective after they have been allowed to dwell on a surface before wiping. This not only improves the effectiveness of the product, but also helps to reduce chemical waste. Dwell times are often listed on product packaging, but can always be found on material safety data sheets (MSDS). • Focus on touch points. In most cases, not all areas of a restroom need to be cleaned every time the room is serviced. Focusing on high-touch areas that should always be cleaned reduces the amount of chemical used. • Consider chemical-free cleaning alternatives. In recent years, no-chemical cleaning procedures have received considerably more attention. This includes equipment that cleans using high pressure, ozone or ionized water, vapor or steam-heat cleaning, or the increased use of microfiber. These no-chemical cleaning alternatives are likely to have an increasing impact on the industry in years to come. • Use green, recycled and biodegradable paper products. 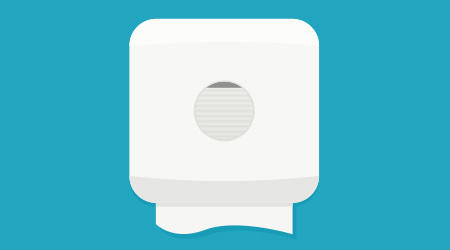 Also analyze the benefits of large-roll towels and dispensers that control product usage. Some facilities might also opt to go paper-less, shifting to energy-efficient hand dryers. • Consider biobased cleaners. Many biobased cleaners are now green certified, and because these cleaners are made of agricultural byproducts, they promote sustainability and reduce the impact cleaning can have on human health and the environment. • Employ personal protection. Cleaning workers are often the first to be impacted by the use of cleaning chemicals. Workers should always wear protective clothing — including gloves, goggles, etc. — and ensure the area they are cleaning is well ventilated. This is especially important when cleaning restrooms. For information on green restroom products and water conservation, click here. Stephen P. Ashkin is president of The Ashkin Group, CEO of Sustainability Dashboard Tools LLC, and coauthor of "The Business of Green Cleaning" and "Green Cleaning for Dummies.""